If you haven’t noticed yet, I have a section for trading T-Shirts (top menu). I’ve lowered the price to $18.50 and with the following code, you get free shipping: HOLIDAY07 (for US), CADHOLIDAY07 (for Canada). So far there is the one design to the left. But I’ve got a lot of neat ideas for other designs. If you are a pro with Adobe Illustrator and have a talent for design, drop me a note. I could use your skills. Every time I wear the shirt, I get a lot of compliments and tonnes of people laughing from a distance. The best reactions are when I walk around the financial district. The shirt is an original, you won’t find it anywhere else (unless some fob has swiped it from my blog). I chose to make and sell it through Spreadshirt not only because it is so easy, but also because of the quality of the material as well as the great service. I’ve ordered several shirts through them - my own and others - and I’ve never had a problem that they haven’t quickly fixed. When they say 100% Satisfaction Guaranteed, they really mean it. 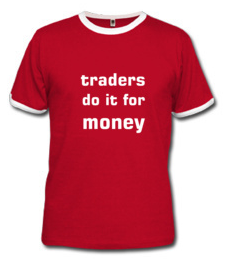 If you know a trader, it would make a great holiday gift. Or buy it for yourself and let the world know why you trade.